Helping Haiti Work | Helping Haitian women improve their communities by providing renewable small business loans. 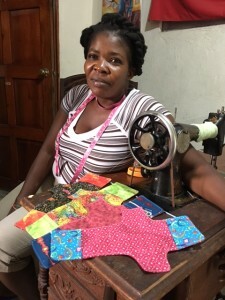 Helping Haiti Work is a nonprofit organization providing microcredit loans since 2012 to women in Limbe and Ranquitte, villages in the northern part of Haiti. Starting in 2016, we opened 2 sewing centers in these same villages where women construct reusable menstrual pad kits, diapers and baby blankets. Our seamstresses are paid a living wage for their work and also have been trained as Ambassadors of Women’s Health, providing education to girls and young women in their communities. Our clients lack collateral for traditional bank loans. Many of them have been raising children and caring for elderly relatives. These women want work to support their families, have hope for their children’s future and they have the drive to help their community. 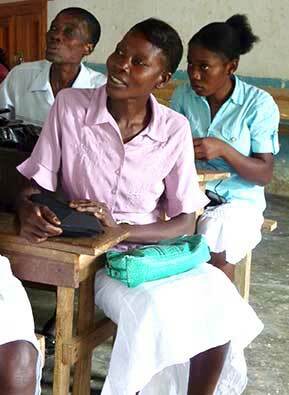 Our program is designed to empower women and encourage entrepreneurship. Our clients apply as a group of ten. 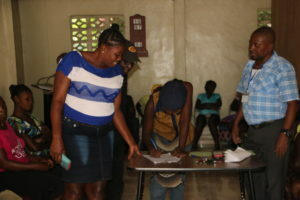 When approved, they each receive $200 US funds in Haitian currency. These women support each other in their businesses. Some use their funds to travel to the Dominican Republic or Cap Haitian to buy items in bulk, then sell the items at their local market. Others cook in their homes and resell the food at a market stand. When every member of the group is established in her business and can pay back her original loan of $200 US, the group has the option to borrow more to further invest in their businesses. 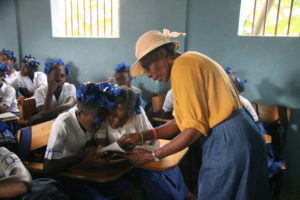 For more information on Helping Haiti Work, view our 2 minute video. Please contact us with questions.